NOTE: These are the changes in Developer API v7.1. It is supported in Layar client v7.1 (and above) on both Android and iPhone. Detailed Description: This value specifies the size of the widget with respect to the reference image/Page, preserving the aspect ratio of the widget. This also affects the size of the content within the viewport, i.e. 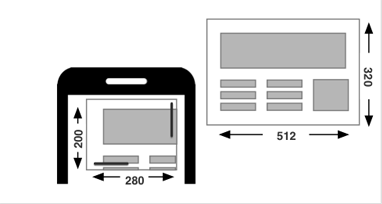 the pixel size within the viewport will scale proportionally as the value of size is changed. Enables interaction within the viewport. If set to false it will overrule the scrollable parameter and its value will be considered as false. In that case users will no longer be able to interact with the page content but view it. Once viewport.interactive is set to false, it is possible to attach POI level actions to the HTML widget. If a user clicks on the HTML widget, the action will be triggered. For more information on actions please check actions . What is the difference between size and width * Height of viewport? The value of the size defines how big the HTML widget will appear in respect to the Page (first image). 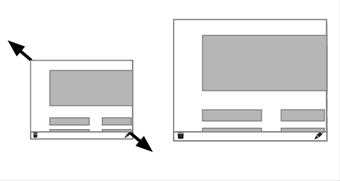 The width and height of the viewport define the portion of the webpage that will be shown in the viewport(second image). In general many of the new HTML 5 elements are not supported but it might be the case that few things may work. We are also curious as what works and does not. Please let us know! We will also update this topic in Customer Support environment so that you can see what works and does not. You are very welcome to share with us what you have created and tips & tricks! So now I do not need a website button i can just display my web page on top of a Page ? Please note that, although HTML widgets indeed allow you to display entire web pages in AR ,we strongly advice you not to do so, since this will just result in poor user experience. It should instead be used to place little snippets of web content that can be dynamic and interactive.